There are a large number of events on National Libraries Day this Saturday (6 February 2016). At our very own Unsworth Library on Sunny Bank Road we have the Library Wall of Love. Come and tell us what you love about your library. Leave a lovely message on our display telling everyone what it is about your library that makes you happy. Call Bury Libraries on 0161 253 7560 for more information. Brandlesholme Community Centre and Library – bookmark making craft session (11am to 1pm).Open to all ages. Bury Library – badge making and paper craft sessions (2–3.30pm), free for all the family. Coronation Road Community Centre and Library – Library Wall of Love (10am to 1pm). Leave a message! Radcliffe Library – book themed LEGO session (10.30am to 11.30am). For children aged 7+, cost 50p per child. Also – Love Libraries Display and Bookmark Giveaway (9.30am to 1pm). Ramsbottom Library and Adult Learning Centre – Library Wall of Love (9.30am to 1pm). Tottington Library – Library Wall of Love (9.30am to 1pm). Unsworth Library – Library Wall of Love (9.30am to 1pm). Whitefield Library and Adult Learning Centre – The Book Doctor is In! (9.30am to 1pm). Also – Knit ‘n Natter demonstration (9.30am to 10.30am). Get tips from friendly knitters. Also – Super Favourite Stories Time (10.30am to 11am). Bring your favourite book to share. Prestwich Library – local historian Craig Brisbane exhibits part of his collection (9.30am to 1pm, and also on Sunday from 10am to 2pm). Also – The Book Doctor is In! (9.30am to 1pm). Get ideas for what to read next; all welcome. More information here. 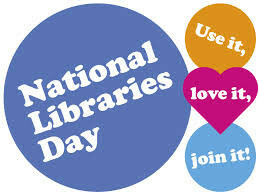 You can also search for events on the official National Libraries Day website here.